(By Daisy Luther) After five years of drought, a new disaster faces Northern California: the imminent collapse of the Oroville Spillway. Nearly 200,000 people were evacuated last night from areas below the Oroville Dam due to the fear that the main spillway is pending imminent collapse and the emergency spillway is literally, just a cleared hill which showed massive erosion when they tested it with a small amount of water. The state has basically gotten all the rain it missed over the past years at once, as three storms called “atmospheric rivers” have unleashed torrential rains that have lasted for days. Another huge rain storm is expected later this week and crews are working frantically around the clock to fix the spillway before more rain falls. 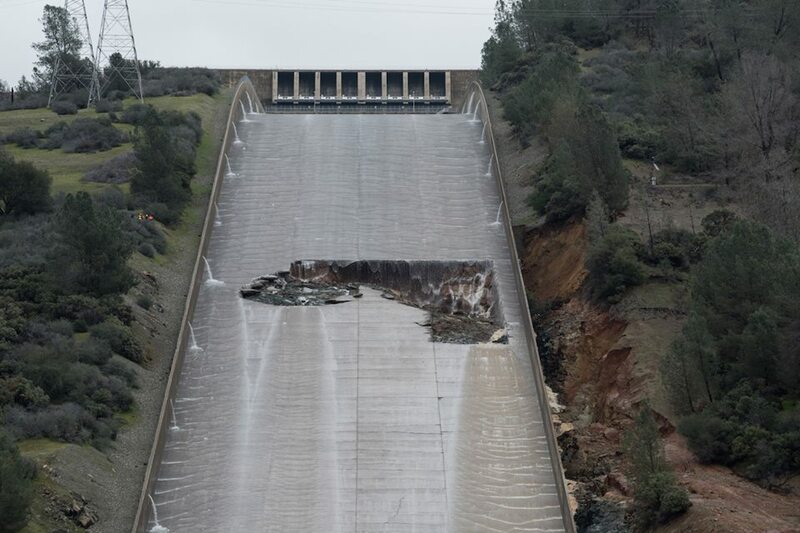 This photo shows the damage to the spillway. But the real lesson here isn’t the faulty infrastructure or the mismanagement of funds. 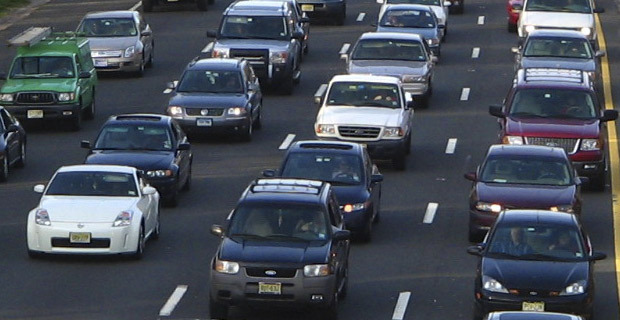 It is the deception of the public and the way that officials will go to great lengths to cover their butts – even if that means giving a warning to the public that could be too late. This isn’t the first time that the government has completely failed in an emergency response to an imminent disaster, and it won’t be the last. Officials waited until they believed that the disaster was only 60 minutes away to evacuate nearly 200,000 people. All week, people have raised concerns about the spillways. But the California Department of Water Resources (DWR) told residents there was nothing to worry about. Here are the updates from their Facebook page from Feb. 7, when the spillway damage was first discovered, until last night, when failure appeared to be imminent and almost 200,000 people were given minutes to evacuate. Emphasis mine. Note that until the very last post, they were assuring everyone that things were fine. Feb. 7: DWR halts flows down Oroville Dam spillway. Engineers investigating erosion. Feb. 8: DWR engineers and geologists continue to assess the concrete erosion on the Oroville Dam spillway. There is no imminent threat to the dam or public. Feb. 8: DWR increases Oroville spillway flows. There is no imminent or expected threat to public safety or the integrity of Oroville Dam. Feb. 9: Despite rumors, Oroville Dam spillway has not collapsed. Additional damage to the spillway has occurred due to the increased flows, but is still being used. Feb. 9: DWR Acting Director assured the public this evening that Oroville Dam is sound and the Department is managing all risks, which likely includes using the emergency spillway. Feb. 10: Lake Oroville releases increase. Inflow to reservoir declining. There is no imminent threat to public safety or the dam. Feb. 10: As of now DWR is not expecting to use emergency spillway, but clearing debris as a contingency. Feb. 10: DWR is monitoring conditions around the clock and hopeful that emergency spillway will not be needed. As precaution, CAL FIRE crews are clearing debris from the emergency spillway. Still no threat to dam or the public. Feb. 11: Water Expected to flow into Lake Oroville emergency spillway soon. Oroville Dam itself remains safe, and there is no imminent threat to the public. Feb. 12: Water continues to be released from both the gated spillway and the auxiliary spillway. At 6:00 am, inflow to the lake decreased to 52,700 cfs. Flows from the gated spillway remain unchanged at 55,000 cfs. Flows over the auxiliary spillway peaked at 1:00 a.m. this morning at 12,600 cfs and are decreasing. Lake elevation levels are trending down. 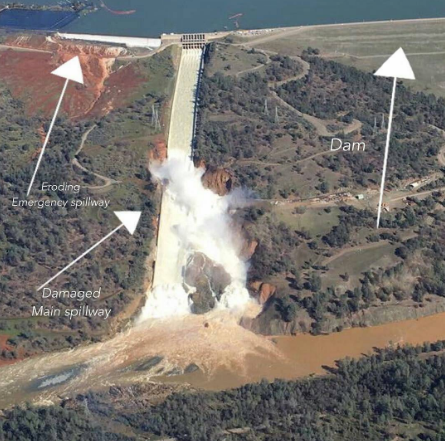 Feb. 12: EMERGENCY EVACUATION ORDER ISSUED: Officials are anticipating a failure of the Auxiliary Spillway at Oroville Dam within the next 60 minutes. Residents of Oroville should evacuate in a northward direction, toward Chico. Other cities should follow the orders of their local law enforcement. Feb. 12: DWR plans to use helicopters to drop rocks to fill in the gouge in the Oroville Auxilliary Spillway to stabilize. This is an evacuation order. Needless to say, chaos erupted as unprepared people rushed from their homes, only to sit in long lines at the fuel stations and get stuck in traffic for hours as the routes out of the danger zone became clogged within minutes. Should the spillway fail, it would result in an uncontrolled release of flood waters. Unprecedented flooding could occur in Oroville, Palermo, Gridley, Thermalito, South Oroville, Oroville Dam, Oroville East and Wyandotte. One estimate suggested that the initial flash flood could reach up to 100 feet in depth, wiping out everything in its path. What lessons can preppers learn from this? From the moment this erosion was spotted, people downstream should have been packing and moving their farm animals, pets, and larger items to higher ground if possible. They should have been preparing for an immediate evacuation, with their vehicles loaded. You absolutely cannot trust the organization who would be at fault for a disaster of this magnitude to be up front in warning of their negligence. They’ll be too busy scrambling for a makeshift fix and rescuing the fish to tell you that you are in peril. All you have to do is think about the Flint water crisis or Hurricane Katrina to recall that officials will cover their own butts first and warn people of danger second. Officials in charge of the Oroville Spillway waited until they believed that the disaster was only 60 minutes away to evacuate nearly 200,000 people. In a disaster, you are completely on your own. For daily email updates, sign up here. One day you may suffer a disaster. And I hope that people are kinder to you than you are to the human beings who are suffering right now. As well, those who like to paint the entire state with a broad brush should know that Butte County is not a liberal hotbed, as you can see from the official election results here. And even if they didn’t vote the way you think they should have, wishing ill on other people is a reprehensible way to live. It reflects on you, not the people you are saying cruel things about. If you are one of the people who thinks that anyone deserves to lose their homes and everything they own, you should be ashamed of yourselves. Your smug judgmental attitude and hatred are part of what is wrong with our country today. If you think that you’re being a Christian by wishing ill on Californians, I’m pretty sure this is the opposite of the behavior Jesus recommended. For those who think this is “Karma” maybe you should remember that Karma works both ways, and one day, you could find yourself the recipient of it. Maybe you didn’t mean to be cruel. Maybe this post will help you to realize that isn’t the way you want to behave. I hope so, because I think most of us are inherently good people. Sometimes we just don’t think before we speak or type. We can always try to be kinder and more compassionate people going forward. But if you are steadfast in this mindset, I know what you’re going to say. And go ahead. Feel free to “unlike” my social media, remove me from your bookmarks, and never come to my website again. My comments section and social media accounts will be much better places without you.